Wild Bill [Hickok]: Hollywood fact or fiction? 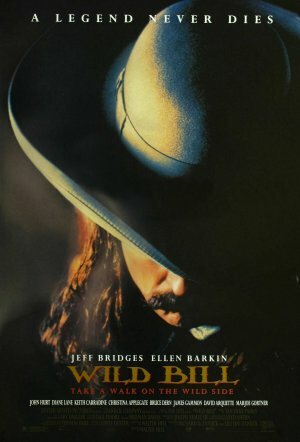 IN THE FILM ‘Wild Bill’, Wild Bill Hickok is admirably portrayed by Jeff Bridges but it bombed at the box office (took $2 mill but cost $30 mill) so you probably haven’t even seen it. The majority of the film deals with the last days of Hickok’s life at Deadwood with the odd b&w flashbacks which do cover some reportedly true aspects of his life – well maybe – let’s just say what has been recorded (perhaps exaggerated) in the newspapers. However, the historical truth of his last weeks/days are rather vague in any event and so the film seems to make them up, particularly with regard to Calamity Jane, and even more particularly with regard to Hickok’s killer, Jack McCall. But, based on my previous observation that you probably haven’t seen the film, I won’t go on about its failings. So, what was Hickok really all about? Well, firstly, his name wasn’t Bill – he was really James Butler Hickok. There are one or two stories revealing how/why he became ‘Wild Bill’ but none of them can be substantiated. Whilst in Nebraska, it has been suggested that he was derisively referred to as ‘Duck Bill’ by David McCanles – he later shot McCanles, but for different reason (maybe). 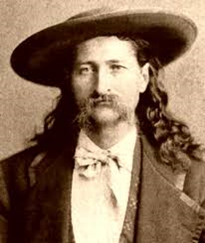 Hickok claimed that he had been nicknamed ‘Shanghai Bill’ whilst part of General Jim Lanes’ ‘Free State Army’ (the Jayhawkers) in 1855 because of his height (he was tall) and slim build. One source says Hickok simply changed this to ‘Wild Bill’ in 1861. It was as a Jayhawker that he meet a 12 year old U.S. Army scout called William Cody – later known as Buffalo Bill. He spent his early life as a ‘freight driver’ and then as a packer/wagon-master for the Union army when the Civil War broke out in 1861. The following year he was discharged for an undisclosed reason. He joined the Springfield Missouri detective police counting troops in uniform found drinking on duty (exciting, huh!). He was then hired by General John B. Sanborn as a scout, but by the end of the war, in 1865, he spent his time gambling in Springfield. According to the History of Greene County, Missouri published in 1883, Hickok at this time was “by nature a ruffian… a drunken, swaggering fellow, who delighted when ‘on a spree’ to frighten nervous men and timid women.” ……. yawn. Now down to business. Well, perhaps. Like most of the Wild West ‘heroes’ it is sometimes difficult to distinguish fact from fiction – especially when, as was Hickok, they became famous through the ‘dime novels’. He allegedly shot and killed 39 men (the dime novels suggest many more). But let’s have a look at what is believed, and most likely, to be true. In Springfield, Missouri, Hickok had a long standing dispute with a Dave Tutt over Hickok’s girlfriend, Susannah Moore. Naturally, the dispute arose because Tutt thought she was his girlfriend. 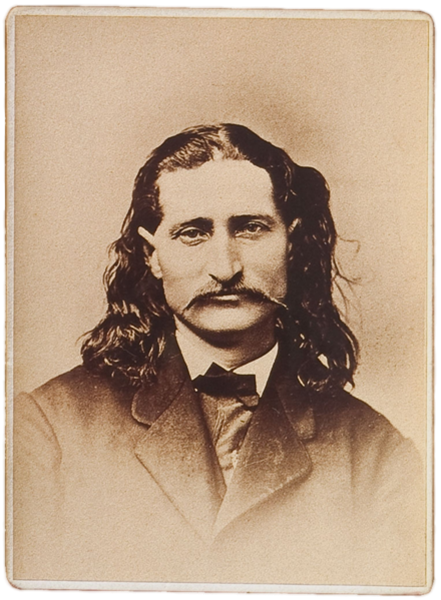 In July 1865, in a card game, Hickok gave Tutt his watch as collateral but told him not to wear it. Tutt wore it in the street and was called out by Hickok – it was a gunfight waiting to happen. Allegedly they were 75 yards apart (a long distance for a duel ). Tutt shot first and missed; Hickok shot second and didn’t. Tutt collapsed and died; Hickok got his watch back – but not the girl. Hickok was arrested for the killing and the charge reduced from murder to manslaughter (I don’t want to get technical about the law but manslaughter implies a non-intent to kill – perhaps at 75 yards he didn’t expect to hit Tutt!). The jury went for an acquittal on the grounds of a fair fight. This was not a popular verdict at the time – presumably because Hickok was not a popular character – or because there was never such a thing as a fair fight with Hickok unless he had no gun! 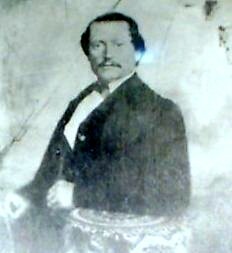 In July 1869, Hickok was elected sheriff of Hays City, Kansas. Within a month he was involved in a couple of altercations, one where he ended up shooting and killing a Bill Mulvey, and other doing similar to a Samuel Strawhun. Then, in July 1870, he had a bar fight with Jeremiah Lonergan and John Kyle, two soldiers from the 7th Cavalry (Custer’s famous unit ‘to be’). Lonergan had Hickok on the floor and fired his gun at Hickok’s head. 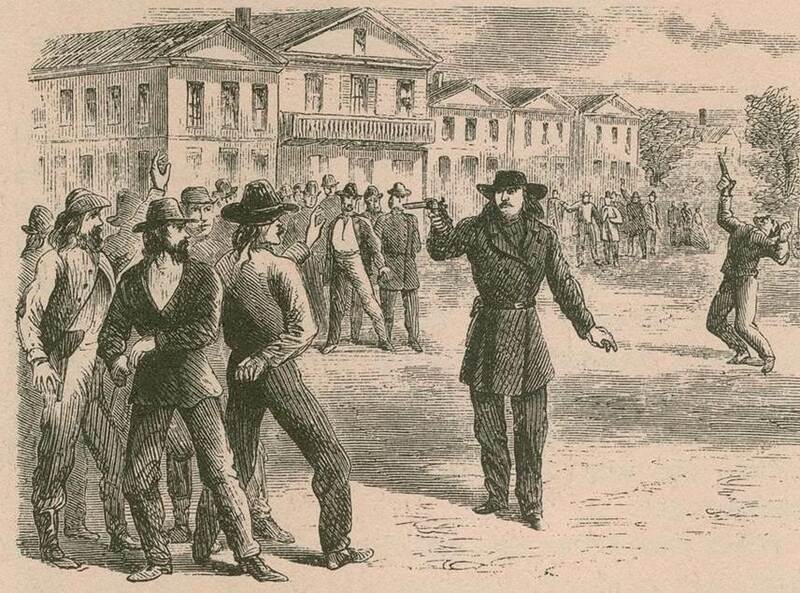 The gun misfired allowing Hickok to gather his own guns. He killed Kyle with two shots and wounded Lonergan with a shot in the knee. Hickok had a reputation for trouble and failed to get re-elected sheriff. Perhaps they expected their sheriffs to fight with pillows ……. In October 1871, Hickok was marshal of Abilene when he encountered Phil Coe, a saloon owner, following a fracas in the street outside Coe’s saloon. Coe had fired a couple of shots into the air and Hickok demanded his gun. 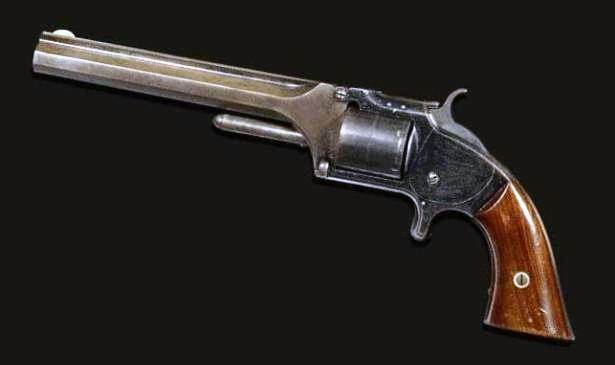 Stupidly, Coe turned his gun on Hickok but Hickok was quicker, fired first and killed Coe. 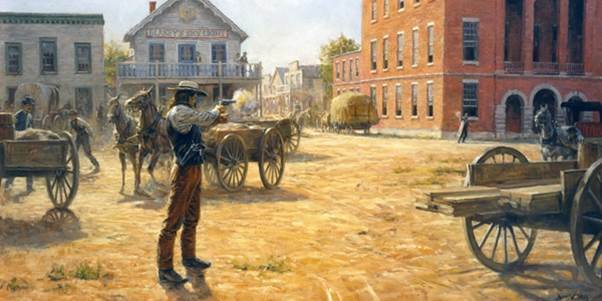 Then Hickok heard a shout behind him, turned and fired, killing the figure running towards him. The figure was his own deputy marshal, Mike Williams, coming to his aid. Hickok was relieved of his duties as marshal as a result. There are no further reports of Hickok gunfights. 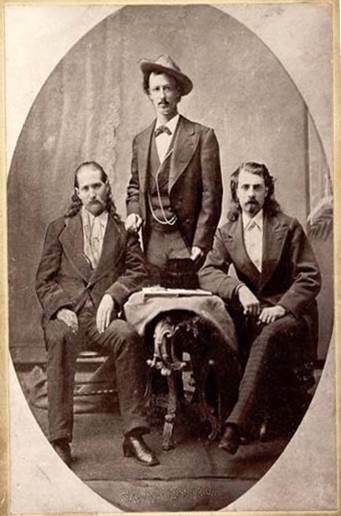 In 1873, Hickok joined Ned Buntline’s Wild West show, Scouts of the Plains, with Buffalo Bill Cody and Texas Jack Omohundro. But Hickok was no actor and was always forgetting his lines. He was soon to give this up, as did Texas Jack. 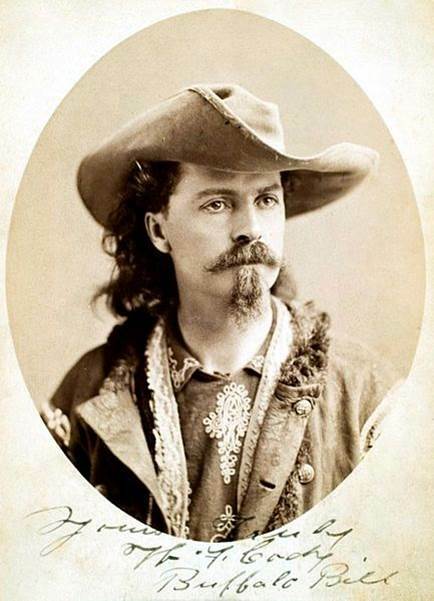 Cody went on to form his Buffalo Bill’s Wild West Show in 1882, which had appearances by Calamity Jane and Annie Oakley. In 1876, in Kansas City, Missouri, Hickok was diagnosed with glaucoma and likely to lose his sight and his health generally was in decline. In March of that year, in Cheyenne, Wyoming Territory, he married Agnes Thatcher Lake, a 50 year-old circus performer. But before very long, in the same year, he headed, alone, to Deadwood, in the Black Hills of South Dakota, to make his fortune (well, that’s what he supposedly told Agnes). He arrived in July and met up again with Martha Jane Cannary (aka Calamity Jane). Jane alleged she had been married to Hickok but this was wishful thinking on her part – it is believed he had little time for her. 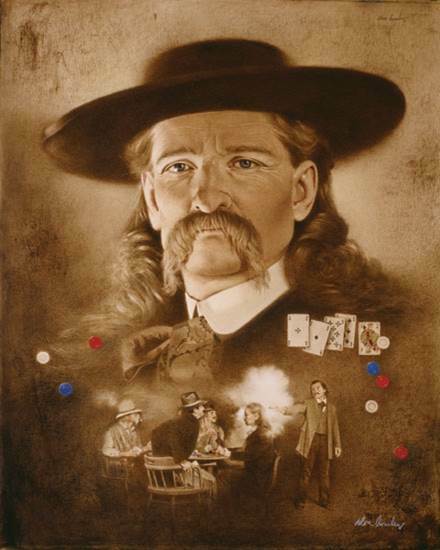 On 2nd August, 1876, Hickok was playing cards at Nuttal & Mann’s saloon in Deadwood. He had his back to the door – unusual for him as he liked to see who was coming in. Well, one Jack McCall was coming in and came up behind Hickok and shot him dead at point blank range. Hickok was playing five card stud and was holding a pair of aces and a pair of eights (the fifth card had been discarded and not replaced) – now known as ‘Deadman’s hand’ – not his lucky night. 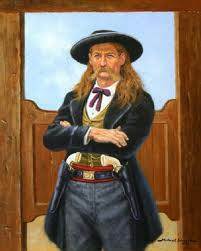 It is not known why McCall killed Hickok, although, at his trial, he did say it was in revenge for Hickok killing his brother, Lew (who had been killed by a lawman in Abilene but it was not know who the lawman was). The jury in Deadwood accepted this and acquitted Jack. Is that retrospective defence of another?! McCall left town but had to brag about the deed and was arrested again in Yankton, Wyoming. His trial in Deadwood was not recognised as the town was still in Indian territory and not part of the USA. This time McCall was not so lucky – he was found guilty and hanged. Hickok was buried in the Ingelside Cemetery in Deadwood, but in 1879 he was moved by his friend, Charlie Utter, to the new Mount Moriah cemetery. His original wooden grave marker went with him but was eventually destroyed by souvenir hunters who whittled bits off it! It was replaced with a statue of Hickok which was also destroyed by relic hunters. Then came a life-size statute which was defaced. So the grave area was enclosed in a cage for protection. But in the 1950s this was broken into by more relic hunters and the statue stolen. 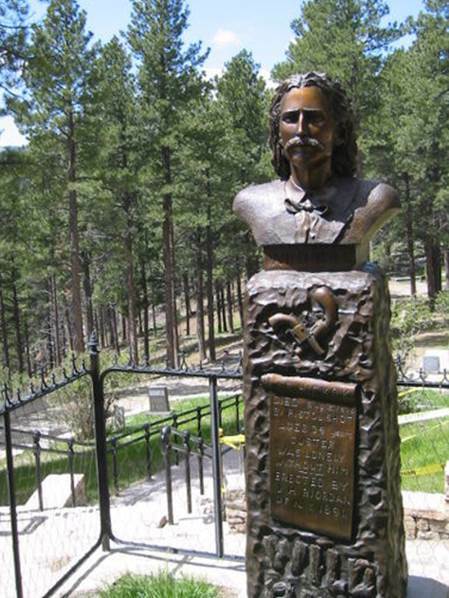 Finally a cast-iron fence was erected along with a new bust of Hickok. 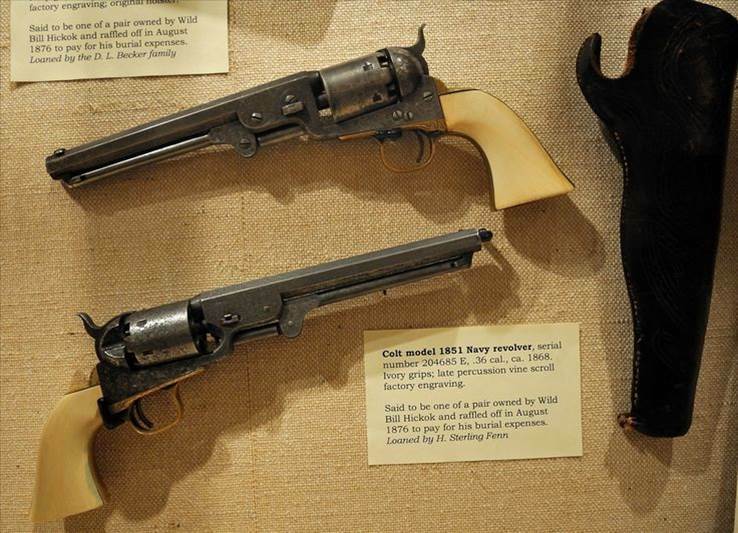 Hickok’s favourite guns were a pair of ivory handled cap-and-ball 1851 Colts .36 Navy Models pistols (if that means anything to anyone). They were sold to two separate people after his death to pay off his debts. They were supposedly reunited and appeared in the Buffalo Bill Museum in Cody, Wyoming – but there are some sceptics who suspect they are not the genuine items. In fact, he had several guns. The gun he had when he was shot was a Smith & Wesson No.2. This gun went up for auction in November 2013, at Bonhams, San Francisco, California. The final bid was $220,000 – which failed to meet an undisclosed reserve (ca. $300,000). Wow, some expensive gun! Hand gun accuracy was notoriously bad – at the OK Coral, Wyatt Earp & C0 were missing at 10 yards (well, some of them were) – so, although Hickok was a supposed to be a pretty good shot, 75 yards is a bit over-optimistic! 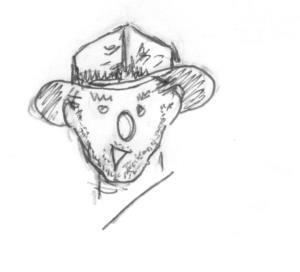 Next week: Okay, enough Wild West, let’s go back to some archaeological characters: John Pendlebury, Hollywood fact or……. no, Hollywood didn’t make a film of him, but it should do. Not just because he was an archaeologist of great courage, determination and non-fiction, but because ….. ah, find out next week. Whilst in Italy, I was reviewing some oddments of Roman pottery when I met a most agreeable and charming Italian archaeologist. Unfortunately, the time I chose to seek his learned advisement, his sister had just produced twins, a boy and a girl, and I could gain little sense from him over his understandable excitement at being an uncle. I enquired as to what they were called. ← The Alamo: Hollywood fact or fiction? I’ve enjoyed the little bit of Wild West history. Very interesting.